How to Watch the Tournament - College Hockey, Inc.
ESPN, TSN to provide wall-to-wall coverage of the NCAA Tournament. 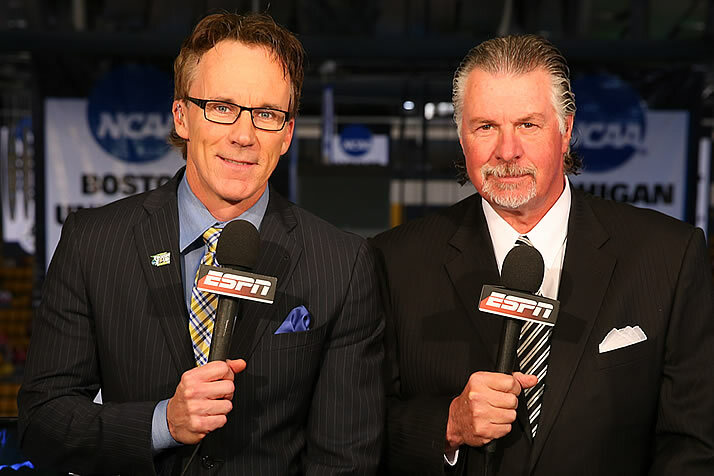 John Buccigross and Barry Melrose will handle play-by-play and color commentary for the Northeast Regional and Frozen Four. Fans can find every game of the 2019 NCAA Tournament on the ESPN and TSN family of networks, from this weekend’s regionals through the NCAA Frozen Four. The Frozen Four, April 11 and 13 in Buffalo, will be broadcast by John Buccigross, Barry Melrose, Quint Kessenich and former Boston University standout Colby Cohen. The semifinals will air on ESPN2 and TSN2, while the championship game is on ESPN2 and streamed on TSN.ca and the TSN App. Hextall will be the first woman to call play-by-play for the men’s hockey championship. Every game will be available in the U.S. on the ESPN App. TSN will stream every game of the tournament to subscribers in Canada on TSN.ca and the TSN App. The semifinals will also air on TSN2. This marks the 15th consecutive season that ESPN will carry the tournament in its entirety, and the 40th year that the network has televised the national championship game.